The work I did not tell him everything is a hybrid of sculpture and photography. In it, the viewer enters the floating wooden circle and experiences the interior space of the piece as a horizontal, 360-degree slice of the ocean landscape where the artist’s hand punctuates each one of the sequential landscape images. 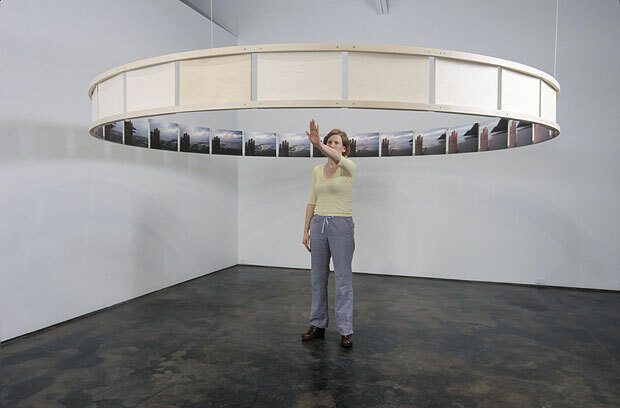 As the viewer turns to follow each image in the circle, she experiences a virtual three-dimensional panoramic landscape. Finally, Wiggins’ own physical experience is translated into a cinematic and phenomenological experience for the viewer through the integration of the digital images with the sculptural space.